Is meeting new people your jam? If so, the Hospitality Committee has just the spot for you: the Jam Ministry at Johns Creek UMC. Lead by Maureen Youngman, the Jam Ministry team delivers a small jar of locally produced jam and information about the church to those families and individuals who register their attendance for a second time on a Sunday morning at the church. The Jam Ministry consists of jam assigners, jam deliverers, and a few administrative roles. The assigners receive a roster of second-time visitors, then find a deliverer who lives near the visitor. Armed with delicious jam, helpful JCUMC information, and a warm smile, the jam deliverers call on the second-time visitors. Sometimes the interactions are brief, sometimes a bit longer, but both the visitor and the jam deliverer enjoy getting to meet someone new and provide a warm welcome to JCUMC. Jam delivery team members report responses like: “I delivered Jam today. What a lovely lady. She loves the church and the Music. She was a Stephen Minister at her previous church.“ Or “I delivered jam today. Mr. W came to the door and spoke to me through the glass and said they were sick. I explained I was delivering jam and visiting from JCUMC and wished them healing.” And sometimes the message is “I tried a couple of times and ultimately left it at their door then later left them a phone message. I’ll keep looking out for them.” Making a jam delivery can fit into anyone’s schedule – you only need to be willing to share of your time and heart. 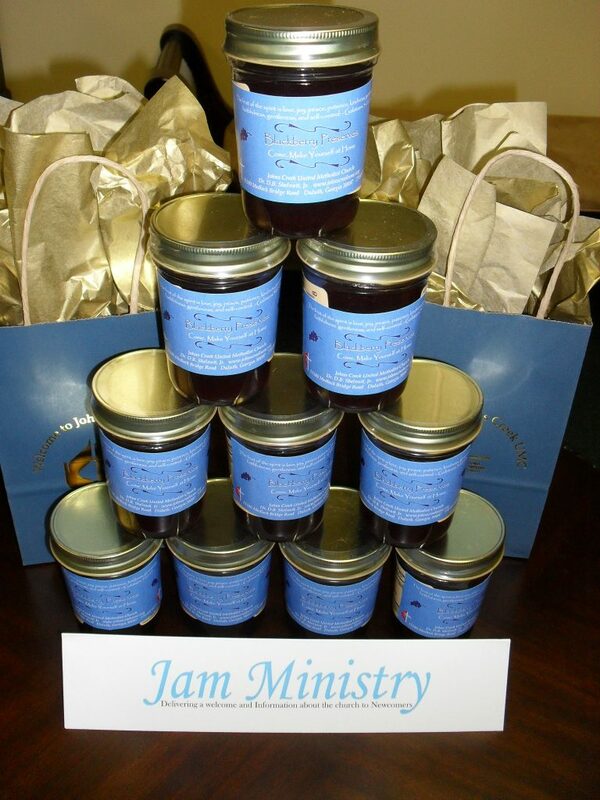 If you enjoy welcoming potential new members and sharing your love for Johns Creek UMC with others, the Jam Ministry could certainly use additional Jam Deliverers. If you want to know more about this ministry or volunteer to help, please email connect@johnscreekumc.org.